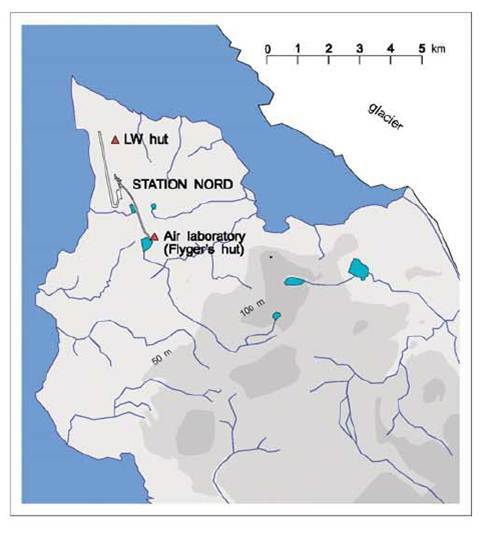 Abstract: The Villum Research Station renovation of Station Nord expanded upon the historical atmospheric composition sampling facility with the addition of a laboratory facility as well as a state-of-the-art clean air sampling facility. The research facilities were established by the Danish National Environmental Research Institute (NERI), which is now merged with Aarhus University (Department of Environmental Science runs the Villum Research Station). The facility supports both long-term measurements of Arctic aerosol physical and chemical properties, and campaign laboratory space for short-term process studies. Station Nord (The Danish name Nord means North in English) is a Danish military station with a small runway, operated by 5 soldiers throughout the year. It is located at 81° 36' N; 16° 39' W in North Greenland. The Department of Environmental Science at AU operates a monitoring hut (Flygers Hut) located 2 km outside the military camp at Drikkevandss¸en that is used to measure air pollution components. Station Nord is located on a peninsula and surrounded by perennial sea-ice. The sea north of North Greenland is extremely interesting because the multiyear ice is predicted to persist for the longest period. This makes Station Nord an ideal location for studying climate interaction involving Arctic haze, consisting of high levels of pollution that lead- among other phenomena- to reduced visibility and special processes occurring at the interface between the cryosphere and the atmosphere.